← Hard Not to Smile! Yesterday was a double “small moments” day for me. 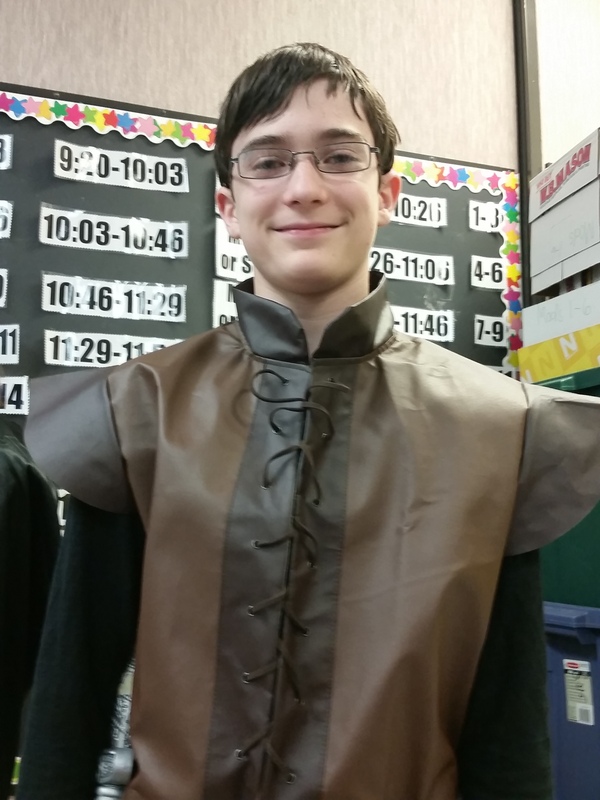 First, I started off at my oldest son’s class play, The Sword in the Stone. They had to create all the scenery on their own and came up with their own costumes. They have been working on all of it for weeks. There were many different parts in the play and my son was given the part of King Leodegrance which had a small speaking part. My son is not one to put himself out there so I was a tad nervous on how he would handle it. The night before the play I suggested to him that he speak loudly because he tends to be more on the quiet side. Act One was over and my son was going to be in Act Second. I started to feel nervous as I saw him get up in front ready to walk out in front of everyone. Up until this point, all the other kids were really good; clear, loud and showing enthusiasm as they appeared on stage. They all looked really comfortable. I was hoping that he could pull it off and speak up so everyone could hear him. Then came his moment. He came out on stage and with my video in hand I watched King Leodegrance appear; confident, loud, engaging and my heart burst with such pride. He did it, he looked and sounded great. I couldn’t have been more proud. When the play was over he came up to me and I told him how great he did. He just looked at me like it was no big deal, it was a piece of cake. But as his mother I know it added one more notch of self confidence on his belt that he didn’t have when he walked into school that day. As a parent, you wish that you could hand out all the characteristics you want your children to have in the beginning to make life easier and more enjoyable from the start. But you know that it is a process and they have to learn along the way living through experiences. To recognize when they have just earned one of those essential building blocks in life that will help them on their way to adulthood is priceless. There have been a few “small moments” over the years with my boys that have brought me to tears. Not tears of sadness but tears of such pride that overwhelm me. The first couple of times it happened I couldn’t believe how my emotions came out of nowhere but I was so proud of them that I couldn’t contain it. I didn’t expect such an overwhelming reaction. This had been one of those days for me but little did I know that I was about to have a second “small moment” with my youngest son too. 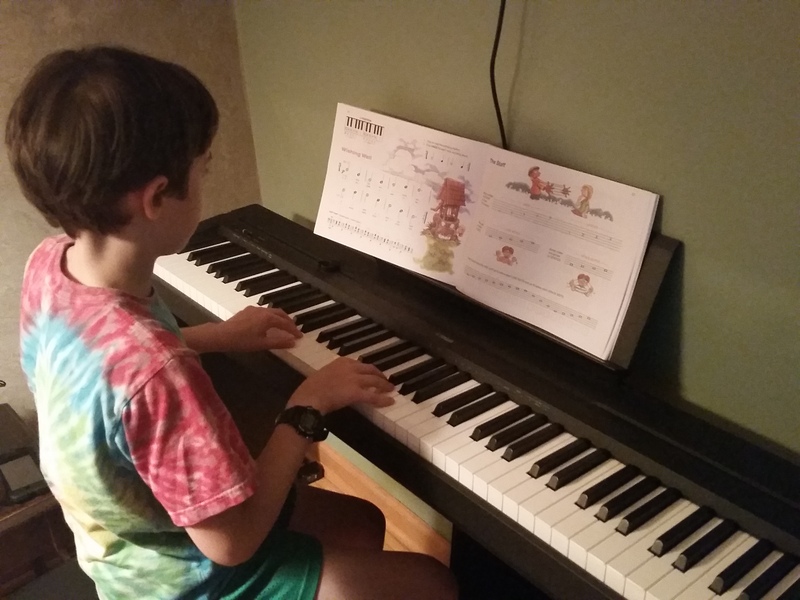 He recently started piano lessons. And each day he sits and practices what he learned in his last lesson. I was sitting at the kitchen table doing work and he was in the room next door playing the piano. I stopped for a minute to hear him actually playing a song. I walked in and stood behind him and said, “You know you have had only two lessons but you are really good at it. It is amazing that you are playing a song so soon.” Without hesitation, he said to me, “It isn’t me, it’s my teacher. She has the perfect teaching method.” He genuinely won’t take credit for how he is playing. I said well it might be her perfect teaching method but you are doing the work and you are the one playing the piano so you should take some credit. And he just simply said, “No, it’s her perfect teaching method.” I just looked at him and smiled. He is truly a humble kid at 9 years old and he couldn’t make me more proud to be his mom. So yesterday was a full day for me. Here’s to finding your “small moments” in the day. Sometimes they will make you burst with such pride it is hard to contain yourself. What an amazing feeling it is! This entry was posted in appreciating life, appreciation, bursting with pride, children, hardwork, kids, music teachers, parenting and tagged appreciate life, appreciation, boys, bursting with pride, character, children, dads, encouragement, life lessons, nervous, perfect teaching methods, piano lessons, playing a song, small moments, sons, The Sword in the Stone. Bookmark the permalink. Aviets: Thank you so much for your kind words. I am in no way a writer and I find it hard to convey how I feel so it means so much that you like my stories. Hope you are enjoying your “small moments”. Amy, I appreciate your comments. I have to say that I am really enjoying this time with my boys. Maybe it is their age or maybe it is because I started this blog and I am trying to be more aware of life around me but either way I am glad you can related and get what my stories are about. They will grow up too fast and I want to try and appreciate as many “small moments” now that I can. It sounds like you do the same with your daughters.